In most states patients have a legal right to make a video or audio recording during their medical visit. In 39/50 states only the person performing the recording needs to provide consent. Hospital or clinic rules prohibiting recording do not supercede state law and are often not effective. First and foremost, we shouldn't say things that we wouldn't want to hear played back, so assume you're being recorded at all times. If you discover you are being recorded, ask the patient why because more often than not it’s not for nefarious reasons. A recent survey found that 15% of the people polled said that they had secretly recorded conversations with healthcare providers in the past and the person they were recording did not know they were being recorded. An additional 11% of people had firsthand knowledge of a friend or family member who has recorded a healthcare provider. 35% had never recorded a healthcare provider or heard of someone else recording a conversation with their healthcare provider but would have no problem doing so in the future. 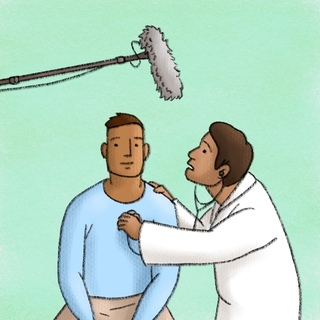 Overt recording is done when the patient asks to record the conversation to preserve it for the future and the provider is aware the recording is happening. It is at the provider's discretion to allow the patient to record their conversation but it is certainly not illegal. Electronic Communications Privacy Act states that you cannot record or intercept any kind of communication, whether it's electronic, verbal, written, without at least one party's consent. In the case of someone recording in a medical setting, the patient recording is the consenting party so this is perfectly legal. The majority of the states are one party consent states, so in any kind of communication, one party needs to know they're being recorded, but not everybody has to know. There are 12 states that are all party consent states, that means you cannot by state law record somebody unless they know they're being recorded. These states include California, Connecticut, Florida, Illinois,Maryland, Massachusetts, Michigan, Montana, Nevada,New Hampshire, Pennsylvania, and Washington. Many hospitals and clinics may have a policy that says you are not allowed to record on site. However, if you, for whatever reason, have to enforce a hospital rule or a clinic rule this likely goes against state and possibly federal statute and could put you at legal risk. One of the strategies is to just confront the issue and say, "Are you recording me?" The goal here is not to expose the patient them, but to really understand why they are doing the recording, it may just be something simple. Escalating the situation really is never a good answer. Federal law and most state laws support their right to do so. Thank you for this segment. Are there any laws regarding posting recordings to social media? I am a PA at an Urgent Care clinic. Earlier this year I had a patient in the afternoon tell me they saw me on Instagram earlier that day. I don't even have an Instagram account. She showed me the video and sure enough, it was me. A morning patient's friend, who was present in the exam room, secretly recorded part of the physical exam and posted it on Instagram. I assume the patient knew he was recording it. It was a benign exam for a simple otitis externa, but it still made me feel uncomfortable. What should be done in that situation? I'm not sure abt this.. when u record a conversation on phone, like a real phone call, u MUST have a beep every so often so someone knows yr being recorded. I've talked with a lawyer. This would be true of in-person conversation. Ill get statute. No one here knows this ... so until further notice..its not advised to be recorded. U can always state no phones in pt rooms in clinic. Im waiting to hear statute. The first comment is referring to a "beep warning" which is a technique that has been used primarily in states that require a two party consent. For instance in California there have been cases where the court ruled that the presence of a periodic beep made it clear to both parties that the call was being recorded and constituted what is essentially implied two party consent. Looking through the wording of the laws for other states, most of which have one party consent laws, the issue of the beep warning would not apply since only the person recording the call needs to provide consent. Plenty of clinics have rules prohibiting the use of recording devices in clinical areas, the issue is that most of these rules contradict the existing state laws and are essentially unenforceable. The second comment regarding social media is interesting. In a one party consent state the patient's friend would have a legal right to make a recording but it gets a little trickier when the social media aspect comes in to play. Best I can tell the recording is property of the person who makes it and as a provider we don't have a ton of options if the owner puts it out on social media. In an extreme situation the provider might be able to make an allegation of slander but I can't imagine this would be effective.